The needs and rights of lesbian, gay, bisexual, transgender, and questioning (LGBTQ) students and families are often ignored, generally misunderstood, and only rarely given priority by the school system. This book provides a practical and useful guide for school-based mental health professionals to support students, families, teachers, and administrators in the development of a safe, inclusive school environment for all LGBTQ students and families. 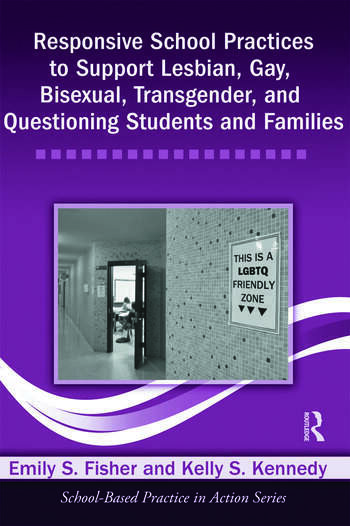 It begins with an overview of the unique issues and challenges faced by LGBTQ students and families, including a discussion of sexuality and gender identity development within the interconnected contexts of home, school, and community. Practical steps are given for creating an inclusive school environment; implementing prevention and intervention techniques to address discrimination, bullying, and violence; and organizing effective counseling programs for LGBTQ students. These school-based efforts are then extended to working with families and communities to reinforce steps taken in the school context. An accompanying CD includes numerous handouts, sample letters, and other resources to assist the school-based mental health professional in implementing responsive and affirmative practices for LGBTQ students and families. Lesbian, Gay, Bisexual, Transgender, and Questioning Students and Families. Development of Sexuality and Gender Identity. LGBTQ Students in Home, School, and Community Contexts. Law and Policy in Action. Developing Awareness and Sensitivity: LGBTQ Issues in the School Community. Creating Diverse and Responsive Classrooms. Ensuring Safe Schools: Preventing Harassment and Bullying. Counseling Lesbian, Gay, Bisexual, Transgender, and Questioning Students. Supporting LGBTQ Parents and their Children. Supporting Families of LGBTQ Students. Accessing Community Resources. Emily S. Fisher, PhD, is an Associate Professor in the School Psychology Program at Loyola Marymount University. Kelly S. Kennedy, PhD, is an Assistant Professor in the School Psychology and School Counseling Programs at Chapman University.